This pleasant riverside view up river is taken from the village of Hampton Upon Thames which is situated beyond Hampton Court Palace in Middlesex. The area became fashionable in the late 17th century because it was free from the pollution of London and was pleasantly situated on the Thames. The village was easily accessible from the city and several large houses were built. 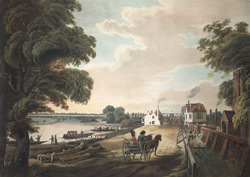 This view by John William Edy is of a riverside street heading into the village.